The Monterey Motorsports Reunion had some amazing machinery. 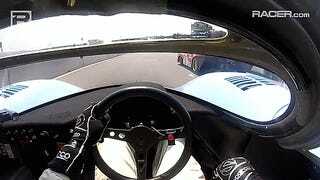 Take, for example, this onboard of a 1969 Porsche 917K. Listen to it. Listen to it now. That world-consuming roar of a 4.5 liter flat-12 engine. Over an octave up, the enjoyable, unmistakable whirrrrr of a racing gearbox. Best of all, it’s a $20 million car that Bruce Canepa is driving flat out because why not? This car was not made to sit. This car was made to own Le Mans. The sweet eight-pound, six-ounce Baby Jesus shines infinite blessings down on this earth (and our ears) whenever vintage races whip out the old Le Mans prototypes. Blessed are the YouTubes, for they bring sweet onboards. Amen.